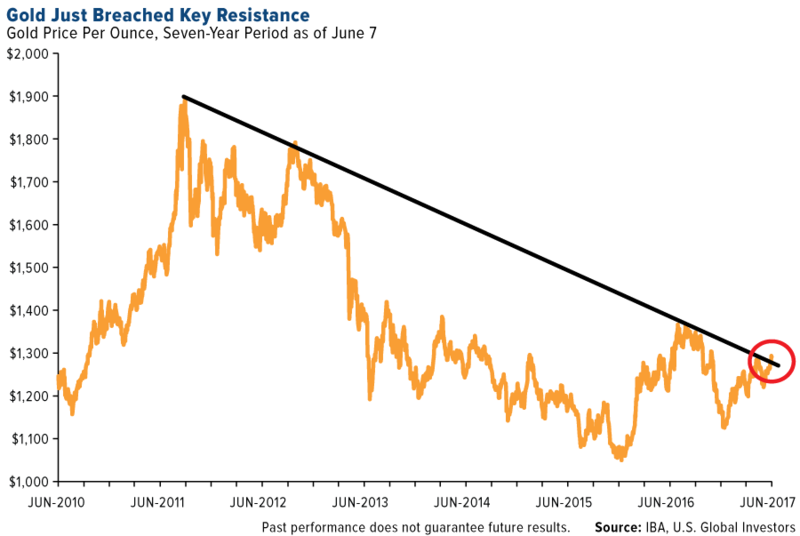 Gold Poised for a Breakout. Top Money Managers Sound the Warning Bell. Gold Vaults a Sign of Increased Demand. Last week investors shrugged off even more drama coming out of Washington. Stocks continued to rally and hit record highs, even as former FBI director James Comey testified that, in his opinion, President Donald Trump fired him in an attempt to lift the "cloud" of the Russia investigation. If true, this suggests obstruction of justice, an impeachable offense. And if impeached, or in the event of a resignation, Trump's political agenda would likely be derailed. The last (and only) time a U.S. president resigned, the Dow Jones Industrial Average lost up to 40 percent, as a recent article in TheStreet reminds us. But markets paid no mind to Comey's insinuations, underscoring investors' confidence that tax reform and deregulation will proceed as planned. And sure enough, just hours after Comey testified, the House of Representatives voted to repeal key parts of the Dodd-Frank Wall Street Reform and Consumer Protection Act, which has contributed to an alarming number of small bank closures since its passage in 2010. This doesn't mean, however, that Trump's problems are behind him. Last week I was speaking with Mike Ward, a top publisher with Agora Financial, who compared Presidents Trump and Ronald Reagan. It was suggested that, despite Trump's apparent affection for the 40th president, he has so far failed to live up to the Great Communicator's memory of optimism and deep respect for the office. Whereas Reagan wanted to "tear down this wall," Trump wants to "put up that wall." Whereas Reagan insisted it was "morning in America," Trump insists it's "American carnage." Reagan succeeded in building coalitions and unifying our allies against the Soviet Union. Trump has already managed to destabilize many of those alliances. During the 1988 vice-presidential debate, Texas Senator Lloyd Bentsen famously ribbed then-Senator of Indiana Dan Quale for comparing himself favorably to John F. Kennedy. "I served with Jack Kennedy. I knew Jack Kennedy," Bentsen said. "Senator, you're no Jack Kennedy." Don't get me wrong. I remain hopeful. President Trump wants to make America great again, and it's still well within his power to do so-if he can practice some self-restraint and not get caught up in petty feuds. Voters support his vision. They gave him not only the Executive Branch but also Congress and most states' governorships and legislatures. You could say I'm hoping for the best but preparing for the worst. I advise investors to do the same. 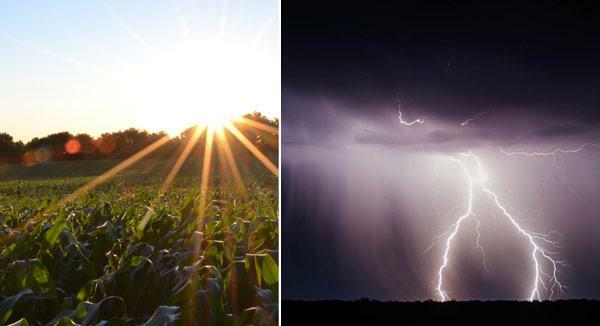 No one can say what the future holds, and it's prudent to have a portion of your portfolio in gold, gold stocks and short-term, tax-free municipal bonds, all of which have a history of performing well in volatile times. Following bitcoin's breathtaking ascent to fresh highs, gold rose to a seven-month high last week on safe-haven demand, stopping just short of the psychologically important $1,300 level. 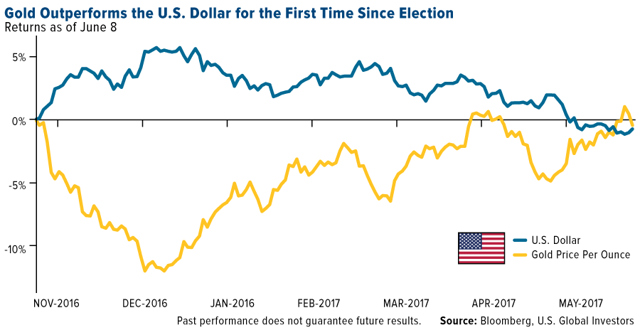 Supported by Fear Trade factors such as geopolitical turmoil-both in the U.S. and abroad-and low to negative government bond yields, gold's move here can be seen as a bullish sign. Year-to-date, the yellow metal is up more than 9.7 percent, even as the stock market extends its rally. This runs counter to what we've seen in the past. 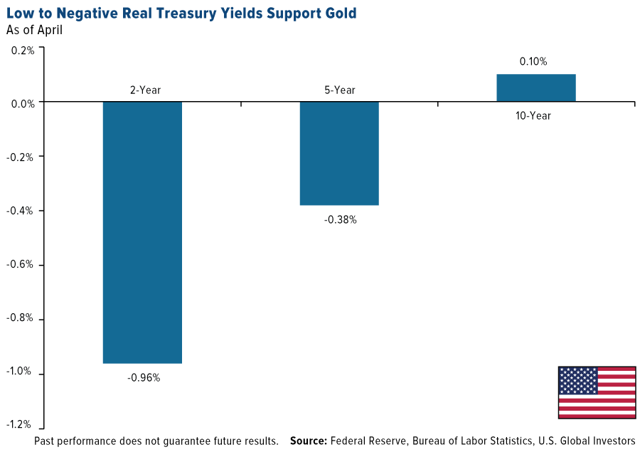 As I've explained before, gold usually has a low correlation to other assets, including stocks and bonds, which is why investors all around the globe favor it as a diversifier. One of the most compelling answers to this question, I believe, is that stocks appear to be overvalued right now, in turn boosting gold's safe-haven investment case. This is the assessment of Bill Gross, the legendary bond guru who currently manages $2 billion with Janus Henderson. Speaking at the Bloomberg Invest New York summit last week, the 73-year-old Gross said markets are now at their highest risk levels since before the 2008 financial crisis. Loose monetary policy has artificially inflated stock prices despite weak economic growth, he said, adding: "Instead of buying low and selling high, you're buying high and crossing your fingers." Marc Faber, the Swiss investor often referred to as Dr. Doom, echoed Gross' thoughts, telling CNBC last week that "everything" is in a bubble right now, similar to the days of the dotcom bust of the late 1990s. And when this bubble bursts, Marc said, investors could lose as much as half of their assets. That stocks appear overvalued could be a driver of gold's performance right now, with savvy investors, anticipating a possible market correction, loading up on assets that have historically held their value in times of economic crisis. A cadre of other top money managers and analysts share Bill Gross and Marc's less-than-rosy market view. At the same Bloomberg event, billionaire hedge fund manager Paul Singer-whose firm, Elliott Management, recently raised $5 billion in as little as 24 hours-warned attendees that the U.S. was at risk of another debt shock. "What we have today is a global financial system that's just about as leveraged-and in many cases more leveraged-than before 2008, and I don't think the financial system is more sound," Singer said. 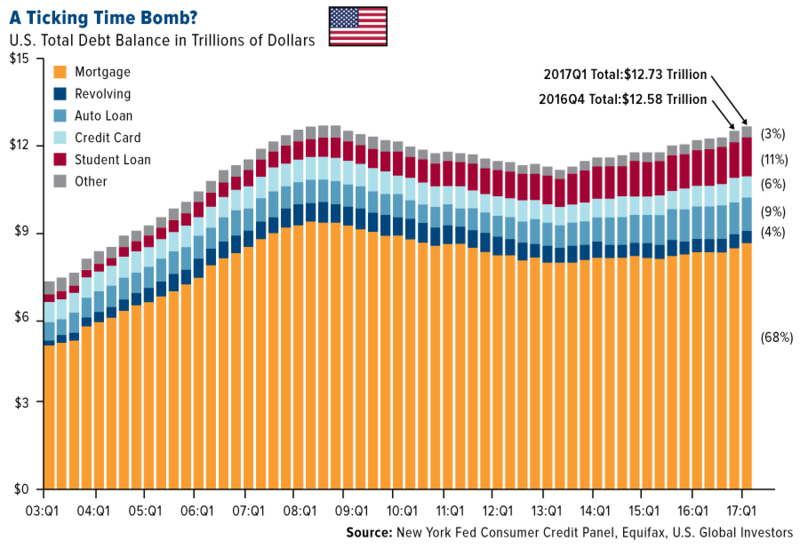 Indeed, U.S. debt levels are higher now than they've ever been, according to the Federal Reserve Bank of New York. In the first quarter of 2017, total U.S. household indebtedness reached a mind-boggling $12.73 trillion. That's $150 billion more than the end of 2016 and $50 billion above the previous peak set in 2008. The world's two largest consumers of gold by far, China and India, are currently importing enormous amounts of the yellow metal on safe-haven demand. Bloomberg reports that China could boost its gold purchases from Hong Kong as much as 50 percent this year over concerns of currency devaluation, a slowing real estate market and shaky stocks. Imports could advance to 1,000 metric tons, which would be the most since 2013. Meanwhile, India-whose affection for gold goes back millennia-saw its imports of the yellow metal rise fourfold in May compared to the same month last year as traders fear a higher tax rate on jewelry. Imports climbed to 126 tons, versus 31.5 tons last May. 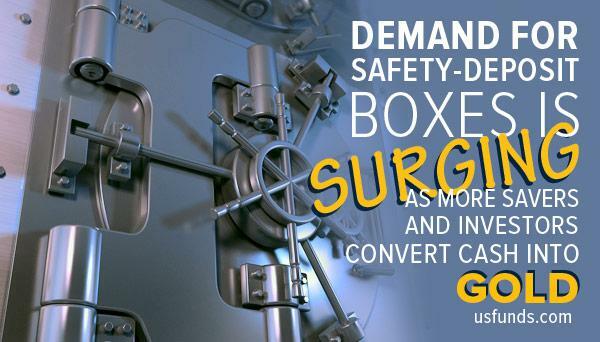 As impressive as this news is, there's no sign more compelling that investors have an insatiable appetite for gold right now than the growing demand for safety-deposit boxes. According to Bloomberg, companies in Europe are scrambling to meet customers' needs for a safe, inexpensive place to store their bullion in the face of negative interest rates and rising inflation. Two firms in particular have plans to build additional facilities capable of holding 100 million euros ($112 million) each in bars and coins. Negative rates are "definitely a driving factor and will lead to more sales and also more storage clients," Marburger said.